CreatureCantina.com: Here's your chance: OWN some Droids Custom original art!! 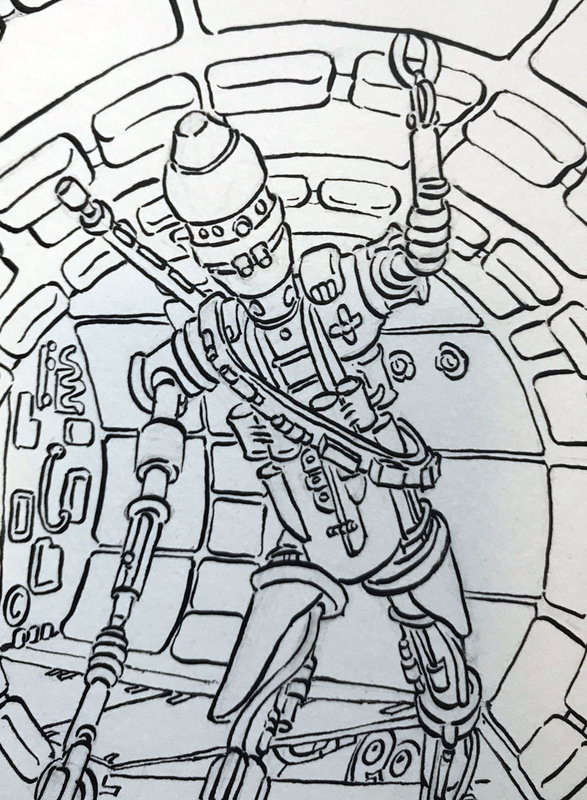 Here's your chance: OWN some Droids Custom original art!! 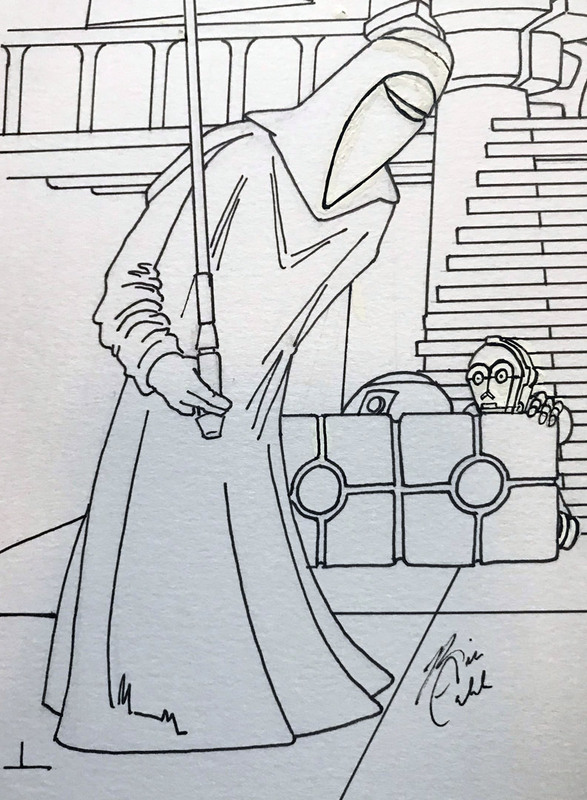 So I couple weeks back I asked the opinion of our readers, should I hoard all my original art from my Droids Customs, or should I share it with the world? The overwhelming consensus was that I should indeed sell it so that others might appreciate it. 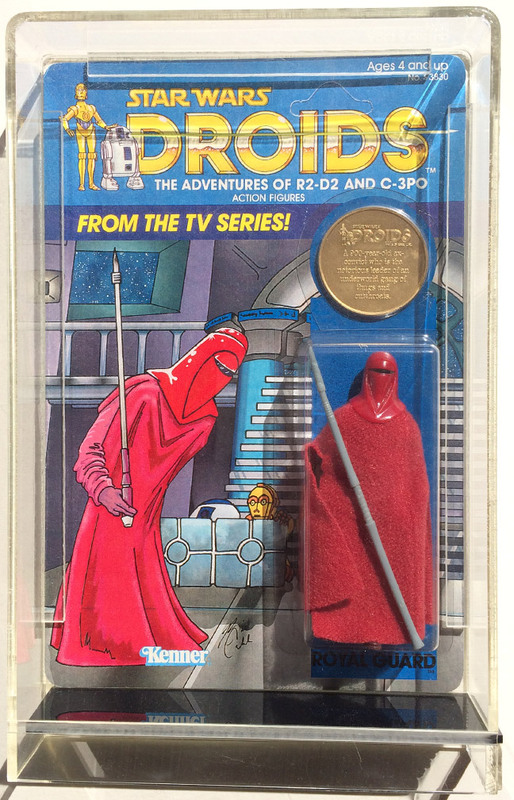 In all seriousness, you know your artwork is desirable, especially involving your Droid’s custom. A man should be financial rewarded and value given for his hard work. I’d put it to auction and set the starting price at $250 and let the free market take care of the rest. Different characters will most likely demand different sums. 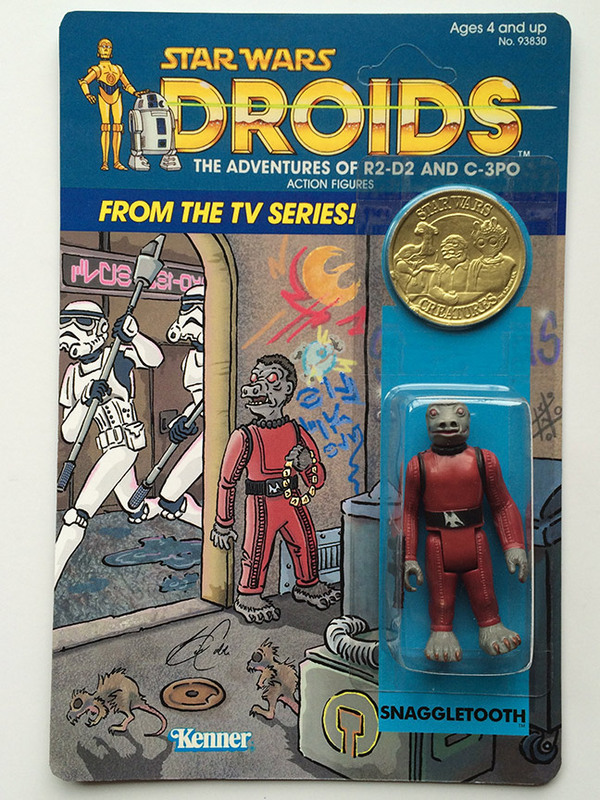 The Droids Snaggletooth actually includes EXTRA art! You see, when I started working with the original drawing within my Droids cardback template, the stack of boxes on the right just lost all meaning. It ended up being a big bar of nothingness next to the bubble background. So I decided to replace the boxes with a dumpster. With the dumpster, you get the little caster and a bit of the lid, and it really pulls together the story. Now - I don't know how you're gonna display that once you buy it. Do you even bother with the dumpster? 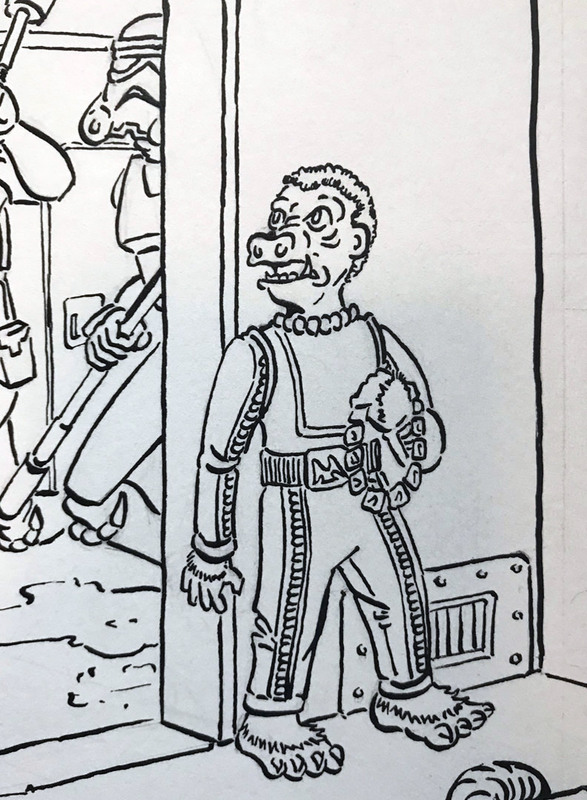 Or do you do some custom mat that shows off the dumpster and the original drawing all in one frame? Or maybe a mat with 3 windows - one with the main art, one with the dumpster, and one with a photo of the final Snag custom. Totally up to you! I'm just giving you everything I used to create the final digital file. The Emperor's Royal Guard is the oldest piece I still own. That custom was plagued with problems. I completed the art almost immediately after I did my Chewbacca. And at the time, I had a friend who owned a color inkjet that would print the fronts and backs for me. And after a couple very successful customs, for whatever reason he just couldn't get these ERGs to print. The color quality was just terrible. The blue was WAY oversaturated. The printer kept dying, or his PC kept dying. And we went back and forth for almost a year before I finally had to move on to a different place to get them printed. In the end I produced a nice, quality custom (by those days' standards), but I learned that I really needed to control as much of my production process myself as I could. And here's IG-88. Fan favorite. My largest run of customs (22!). 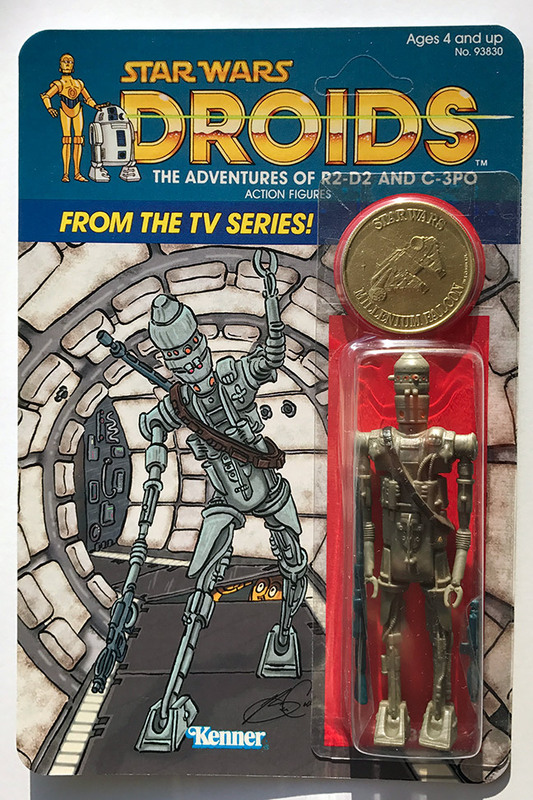 And since there aren't any remotely related POTF coins to IG-88, I threw him inside the Millennium Falcon so I could use a Falcon coin with the customs. If there are any of these customs I expect to garner multiple bids, it's this IG-88. So here's to hoping they get some bids. Not too many bids, though! I know I'm probably going to know all the winners, and I'll just feel awful if I end up costing you guys like $500 or something ridiculous for one of these! So bid low! Unless you won MegaMillions last night... then feel free to bid like crazy.